Propulsion: One 200ihp gasoline engine, one shaft. 72k Photographed prior to World War I. 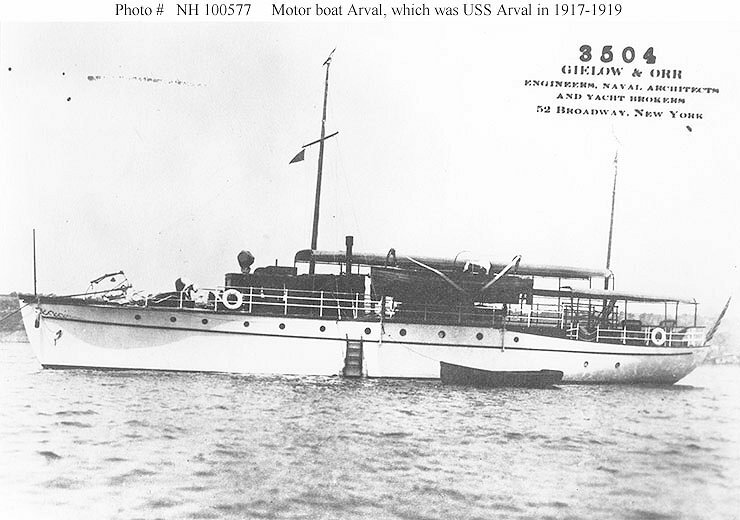 Dictionary of American Naval Fighting Ships History: Arval (SP-1045)-a motorboat constructed in 1911 at Stamford, Conn., by the Stamford Motor Co.-was acquired by the Navy on free lease from Mr. Donald N. Test on 1 November 1917 and was placed in commission at Chicago that same day, Ens. Franklin Smith, USNRF, in command. She departed Chicago on the day of her commissioning and arrived in Charleston, S.C., on the 7th. She was assigned to the 6th Naval District section patrol and was based at Wilmington, N.C. Arval patrolled the coastal waters of North Carolina through the remainder of World War I. In January 1919, she moved north to New York. She was placed out of commission and returned to her owner on 27 February 1919, and her name was struck from the Navy list on that same day.